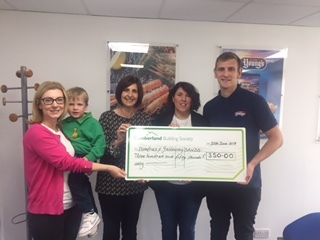 Susan, Lisa (and Matthew) were delighted to attend at Young’s Seafood in Port Street, Annan to receive a cheque for Dumfries and Galloway Sands for an amazing £350. “We organised a screening at our local cinema to the showing of Grease the movie which was full of fun with some of the attendees dressing up. We had lots of fun singing and dancing along to the songs. Huge thanks go to everyone at Young’s Seafood for thinking of our charity.